The earth is overpopulated. Vast ecologies are being decimated by the influx of humans. How can we save earth? What must we do? Thus begins the parable of Freeman Lowell, space ecologist. 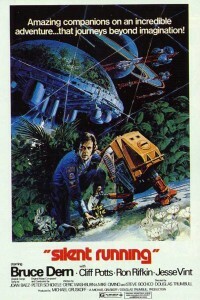 Silent Running (1972) is a diatribe against the human condition, the lack of political will and the ultimate one man can make a difference movie ( if he has 2 or 3 robot companions). Bruce Dern is understated in the role of Freeman Lowell, literally the last man who gives a damn. Thrust into earth orbit along with other astronauts as caretaker to what remains of earths ecology, Lowell fight a moral as well as physical battle to preserve what he has grown to love. Joining him in his estrangement from humanity to save the human condition are three very unlikely partners, Huey, Dewey and Louie, robot helpers with very distinct personalities. They’re not R2D2, but they’re more human than most of humanity in this movie. This story could very easily drop into the bottomless pit of nail biting and despair, but it doesn’t because it is executed brilliantly at almost every level. Ultimately, this is a sad film. It speaks volumes about the frailty of Earth and the callous nature of man. It reminds me a lot of Dr. Suess’ The Lorax, without the happy ending. Freeman breaks down, renounces humanity and gives his future to three two unlikely recipients. This is Dome, sayin’: there is no heresy in science fiction films without light sabers. None at all. You’re two for two in picking out movies that I fondly remember, Dome. I don’t want to give away the details of the ending, but that closing scene was one that certainly tugged at the heartstrings, and it’s one that’s etched in my memory. So, for anyone who reads this–I wholeheartedly agree with Dome that this movie is one I wish you’d seen…and hope you will!